CRNAs due to complete their next step in the CPC Program this year wasted no time in completing the 2-year Check-in when it opened April 3. To date, more than 5,500 CRNAs have already completed the 2-year Check-in, with many reporting that the entire process took less than five minutes. The 2-year Check-in is the mid-point requirement in the 4-year CPC Program cycle. At check-in, CRNAs will confirm licensure and practice, update contact information, review progress in the CPC Program, and pay the $110 credentialing fee for the upcoming two years — the same fee amount and timing as in the past – which supports year-round NBCRNA activities that seek to keep the credential strong. Unsure if you need to check in this year? Your 2-year Check-in deadline will depend on your 2016 recertification or initial certification date. Find a 2-year Check-in deadline chart, FAQs, videos, and more at www.nbcrna.com/2YCI. The process is simple, but you can watch videos or download step-by-step instructions to use as a guide. When you're ready to check in, visit the NBCRNA online portal. This quick and easy process can be completed from a computer, cell phone, or other mobile device. Sarah Sellers, CRNA, placed second in the Elite Women's category of the Boston Marathon on April 16. It was her second marathon, and her placement created enough excitement that the Boston Globe wrote an article about her. She also appeared in other national news and sporting media, including the New York Times. Sellers began the race conservatively before picking up the pace during the final stretch as other runners started to fade. She ran the second half of the 26.2-mile race faster than the first half. Sellers graduated from Barry University in Miami Shores, Florida, and became a CRNA less than a year ago. She works full-time administering anesthesia to patients in Tucson, Arizona. According to reports, Sellers said she has no intention of scaling back on her job as a nurse anesthetist despite her new-found fame. By mid-week she plans to be right back at the head of the table delivering exceptional patient care. An interesting AANA tie-in: Sarah ran the 2016 AANA Walk/Run at the Annual Congress in Washington, D.C., and placed first overall! AANA extends its heartiest congratulations to Sarah on her exciting marathon achievement! Looking for an AANA Volunteer Opportunity? Apply for a FY2019 AANA Committee Now! President elect Garry Brydges is looking for volunteers to fill committee positions in fiscal year 2019. Many committees have positions available for CRNAs and student registered nurse anesthetists. 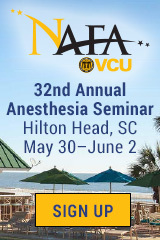 Check out the committee page on the AANA website to read about the various opportunities. Deadline for submission of a committee request is May 15, 2018. Please note: If you currently serve on a fiscal year 2018 committee, you must reapply for fiscal year 2019. The malpractice insurance coverage provided by your employer may not have your best interest in mind. Ensure you have coverage when you need it with a policy that supplements the coverage provided by your employer. Learn more. Bruce Schoneboom, PhD, CRNA, FAAN, AANA Chief Learning Officer, and Lynn Reede, DNP, MBA, CRNA, FNAP, AANA Chief Clinical Officer, will be speaking at Becker's 16th Annual Spine and Pain Management Conference, June 14-16, 2018, in Chicago. The presentation speaks to "Partnering with Academia to Provide Advanced Post-graduate Subspecialty Pain Management Education for Nurse Anesthetist." Nurse anesthetists are well positioned as members of the interdisciplinary team to provide holistic, multimodal pain management for patients of all ages, across the continuum of pain, in all clinical settings (e.g., hospitals, ambulatory surgical centers, offices and pain management clinics), and in the home. Acute and chronic pain are best treated and managed by CRNAs and an interdisciplinary team of healthcare professionals that actively engages the patient in the diagnosis and management of his or her pain for improved well-being, functionality, and quality of life. Learn more about the Becker's conference. Christi Sunna, MSN, CRNA, is one of 93 nurses being honored for Excellence in Nursing by Dallas Magazine in the March 2018 issue. She was recognized in the Direct Care Category and she is the only CRNA recognized this year in the Dallas area for this award. Christi's nomination was among several hundred sent to the magazine from hospitals and clinics throughout North Texas. D Magazine editors selected the most compelling nominations and sent them to a panel of registered nurses in various fields. The judges’ scores then determined a total of 93 winners. Parkland Hospital in Dallas, Texas, had a record 45 nurses selected this year and they were honored at a March 29th ceremony and in the March issue of D Magazine. Sunna has been heavily involved in the promotion of departmental quality improvement initiatives, anesthesia research, and new-CRNA orientation. She serves on the Anesthesia Performance Improvement Committee, including the Insulin Care Guidelines initiative, the Post Anesthesia Care Unit Handoff Project, and the Epidural Education Community Outreach Initiative. She also serves as the department representative on the Hospital-Wide Resuscitation Committee and Advanced Practice Nursing Peer Review Board. She has collaborated with the physicians and is a co-investigator on several departmental research studies. Sunna is currently preparing two additional research proposals, has three co-authored publications in the submissions process, has two poster presentations at a national anesthesia meeting, and has served as the co-author for two National Board of Certification and Recertification for Nurse Anesthetists (NBCRNA) Core Module review manuscripts. Sunna’s extraordinary dedication has decreased the turnover rate of new CRNAs at Parkland, and has increased CRNA job satisfaction. The Parkland CRNA team is stronger and more cohesive as the experienced CRNAs closely mentor the new Parkland CRNAs. Sunna has been an invaluable resource and role model for both the novice and experienced CRNA. Allan Schwartz, DDS, CRNA, has published a chapter called "Airway Management of the Oral Surgery Patient," in the book Oral and Maxillofacial Surgical Clinics of North America. Schwartz is currently associate professor for The Center for Advanced Dental Education at Saint Louis University, St. Louis, Mo. See key points from the chapter and more. The new Sentinel Event Alert and Infographic from The Joint Commission describes the impact of workplace violence directed toward healthcare workers. The focus of this alert is to recognize and acknowledge workplace violence directed against healthcare workers from patients and visitors, better prepare staff to handle violence, and more effectively address the aftermath. Read the report and download the infographic. 1. The hospital provides and maintains systems for extinguishing fires — 86 percent. 2. The hospital manages risks associated with its utility systems — 73 percent. 3. The hospital provides and maintains building features to protect individuals from the hazards of fire and smoke — 72 percent. 4. The hospital reduces the risk of infections associated with medical equipment, devices and supplies — 72 percent. 5. The hospital establishes and maintains a safe, functional environment — 70 percent. In a Becker’s ASC Review article, the American Association for Accreditation of Ambulatory Surgery Facilities (AAAASF) discussed emergency preparedness deficiencies reflected in recent surveys. ASCs must comply with the CMS Emergency Preparedness standards now in effect. Common deficiencies cited by AAAASF surveyors include lack of creation and implementation of an emergency preparedness plan. This plan must include a documented facility and community-based risk assessment, evacuation and shelter plan, communication plan and procedure for proper management of medical documentation. This plan must be reviewed and updated annually. Initial training on the plan must address emergency preparedness policies and procedures for all new and existing staff, individuals providing on-site services, and volunteers. To help facilities get started with creating an emergency preparedness plan, CMS has compiled a list of resources to assist state survey agencies and healthcare providers. Read the article for additional details regarding the deficiencies and available resources to develop and implement the plan. April 21 - 25, 2018 Washington, D.C.
Online registration is closed but it’s not too late to join your peers in D.C. for the most important advocacy meeting of the year. Maximize your professional development opportunities with the comprehensive workshop on two essential areas of practice. Earn up to 22.25 Class A Credits in just two days. Tap into the power of technology at the 85th AANA Annual Congress being held at the Hynes Convention Center. Research out of the University of Colorado, Boulder suggests that postoperative opioid use actually makes pain last longer. The finding was observed in male rats that were subjected to exploratory abdominal surgery, then either weaned off or abruptly withdrawn from morphine relief in the following days. In other cases, animal subjects that received a saline solution were compared against those that received morphine. According to the investigators, rats administered morphine suffered postoperative pain for more than three weeks longer than controls. The longer they received the opioid, with or without gradual tapering, the longer the pain persisted. Although the researchers concede that their findings may not apply to humans in exactly the same way, they say the results form the basis for additional study. "This indicates that there is another dark side of opiates that many people don't suspect," explains senior author Linda Watkins, a professor in the Department of Psychology and Neuroscience. "It shows that trauma, including surgery, in combination with opiates can lead to chronic pain." She and the study's co-author are calling for more study into the association between opioids and chronic pain. They are not alone in their work, with a few earlier small-scale projects involving humans showing a correlation between postoperative opioids and chronic pain as long as one year afterwards. From "Study Shows Post-Operative Medication Can Prolong and Cause Chronic Pain"
In hopes of flagging risk for opioid-induced respiratory depression, a team from Tufts University collected and analyzed respiratory volume data on about 120 general surgery patients. Measurements were taken intraoperatively, in the post-anesthesia care unit (PACU), and after discharge to the general hospital floor, using a highly accurate respiratory volume monitor. Based on readings 45 minutes prior to expected discharge from the PACU, patients were labeled as either high or low risk for opioid-induced respiratory depression on the general hospital floor. If they did not experience any episodes of low minute ventilation, defined as less than 40 percent of predicted minute ventilation for two minutes or longer, they were considered low risk. One or more such events, however, placed the patient in the high-risk category. Any incidence of low minute ventilation taking place within 45 minutes of IV opioid administration on the general hospital floor was deemed opioid-induced respiratory depression. The investigators found that the likelihood of developing this complication was 44.4 percent among the high-risk patients but only 3.4 percent among the low-risk patients. Even among patients who did not receive IV opioids on the general hospital floor, the risk of respiratory depression was six times greater in those who presented as high risk 45 minutes before PACU discharge than those who presented as low risk. In light of the findings, the researchers concluded that monitoring for low minute ventilation events before PACU release allow providers to identify postoperative patients at risk for subsequent opioid-induced respiratory depression. From "Low Minute Ventilation in PACU May Identify Opioid-Induced Respiratory Depression"
Based on the results of a retrospective study, transverse abdominis plane (TAP) block reduces opioid requirements in bariatric surgery patients. The regional anesthesia technique slashed postoperative consumption of opioids, compared with patient-controlled opioid analgesia, by more than 62 percent among patients having Roux-en-Y gastric bypass and by about 60 percent among patients having sleeve gastrectomy. The finding is important, according to Thomas C. Robertson, MD, of Carolinas Medical Center in Charlotte, N.C., who warned that adverse effects like sedation and respiratory depression make opioids particularly dicey for a patient population that frequently suffers from obstructive sleep apnea and is already at high risk for respiratory depression. Reporting at the 16th World Congress of Endoscopic Surgery, Robertson said his team's analysis showed that TAP block—which targets the anterior abdominal wall—also resulted in shorter hospital stays and lower 30-day readmission rates. From "TAP Block Cuts Post-Op Opioid Need in Bariatric Surgery"
An MRI simulator is helping to prepare kids and avoid the need to sedate them prior to the medical test. The Montreal Children's Hospital is the first in North America to begin using the device, which is smaller than the real machine; painted in bright, bold colors; and designed to look like a rocket ship. After an introduction to the MRI process, by lying down in the rocket's "tunnel" and getting a sample of the sounds that an actual MRI makes, pediatric patients are ready for the real deal. In 102 children who have used the simulator in the past 14 months, about three-quarters were able to complete their MRI without sedation. That is important, according to Christine Saint-Martin, MD, who specializes in medical imaging at the hospital, both in terms of a faster recovery time for the child and less lost time from work for his or her parents. In addition, anesthesia providers now have more time to address other patients or tasks. From "Montreal Hospital's MRI Simulator Helps Ease Children's Fears"
Anterior cruciate ligament (ACL) damage is a common sports-related injury among young people, who may face the risk of opioid addiction after undergoing reconstruction surgery. Patients typically require more potent pain relief than what is available over the counter, but a new study from the Orthopaedic Institute for Children (OIC) in Los Angeles could help prevent them from getting hooked on narcotic painkillers. Researchers followed 49 patients over six weeks, observing the number of opioid pills they took after ACL reconstruction (ACLR). In the first-of-its-kind prospective study, investigators documented differences in opioid consumption according to autograft type. Patients undergoing bone-patella tendon-bone autograft were more reliant on opioids, taking a median 29 pills during the study period, compared with hamstring autograft patients, who only took about 19. "These findings suggest that perhaps the number of pills prescribed following ACLR surgery could safely be modified by autograft type to avoid the risk of over prescription," suggested OIC's Jennifer Beck, MD. "The data in the study can help contribute to education for patients and families regarding postoperative pain management and expectations, standardization of opioid protocols after outpatient adolescent ACLR, and potentially help set a numeric value on acceptable prescription size after these surgeries." From "New OIC Study May Help Reduce Overuse of Opioids by Adolescents"
Researchers designed a prospective study to investigate aromatherapy as a potential treatment for postoperative and postdischarge nausea and vomiting (PONV/PDNV). In the sample population of 221 adult ambulatory surgical patients, 113 participants were randomized to standard care and 108 were assigned to aromatherapy. A total of 64 participants, 52 percent in the aromatherapy group and 48 percent in the control group, suffered PONV while in the post-anesthesia care unit or same day care center. All of the patients who received aromatherapy—consisting of a pleasantly scented blend of essential oils including peppermint, spearmint, lavender, and ginger—found the intervention to be fully effective. By comparison, 67 percent of those who underwent usual care—such as taking acetaminophen, antacids, crackers, or soda, or by lying quiet and still—reported that these strategies worked for them. Although patient satisfaction was high with aromatherapy, the researchers observed no meaningful difference in patient satisfaction scores when compared with standard treatment. The study did, however, create a model that identifies patients at risk for PONV/PDNV, especially females and older individuals, with 69 percent certainty. This ability allows the perianesthesia nurse to relay risks to the perioperative team and initiate appropriate interventions, of which aromatherapy is one viable option. From "A Comparison of Aromatherapy to Standard Care for Relief of PONV and PDNV in Ambulatory Surgical Patients"
Journal of PeriAnesthesia Nursing (04/01/18) Vol. 33, No. 2, P. 116 Stallings-Welden, Lois M.; Doerner, Mary; Ketchem, Elizabeth; et al.